Wipaq provides the latest technology in safe keeping and security options when it comes to a large movement of the population such as airports or commercial areas. The full height turnstiles HT60 model is the ultimate in this category of security models as it is featured on the basis of feather touch operations and a lightweight aluminum body with the panels that guarantee a feeling of safety with an open space in between the panels. 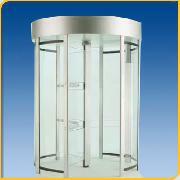 The HT 60 Clear Panel Full Height Turnstile or automatic doors may be ordered in a variety of different configurations. Please call for details.